Five thousand striking workers took over the streets of Sydney’s CBD on Thursday 6 September, demanding fairer laws for workers, the abolition of anti-union bodies, and the right to strike. Hundreds of construction sites were shut down as thousands of workers walked off the job in illegal strike action. They were opposing the Australian Building Construction Commission (ABCC), a union watchdog which persecutes the construction union. The rally happened on the same day as another horrific workplace accident left a construction worker dead and two others injured in Victoria. Wharfies from the three terminals at Port Botany shut down the port with a four-hour stoppage. 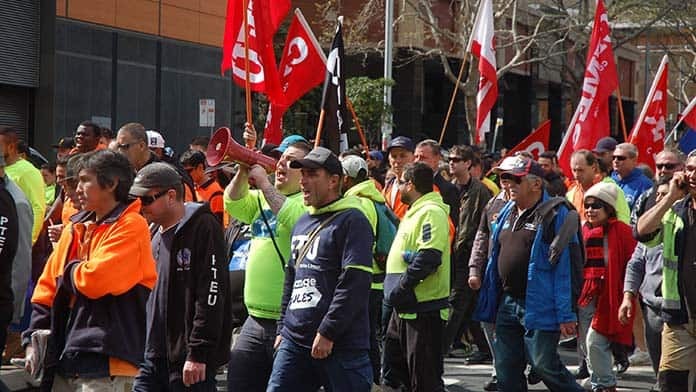 The ETU, the plumbers’ union and the AMWU had strong contingents. ACTU President Michele O’Neil argued that: “We are fighting because the system is broken. We have had 30 years of economic growth in Australia, but workers’ wages are going backwards. This is the fourth time in two years construction workers have walked off the job in Sydney, often joined by the MUA. They are sending a message to the Labor opposition that the CFMMEU expects them to honour their promise to abolish the ABCC when in power. We need more strikes like this, with more unions involved. Another stopwork rally has already been called for 23 October in Sydney, joining unions in Melbourne who will rally on the same day. But with the Liberals’ loss at the next election likely, there needs to be more pressure on the Labor party to meet the union movement’s demands. This shows why we need to build pressure on Labor to really Change the Rules at work. Labor has committed to some significant changes but has not indicated it will do anything to reduce restrictions on the right to strike. Yet so far the bulk of the union movement has restricted the Change the Rules campaign to electoral campaigning in marginal seats, simply designed to elect a Labor government. Maritime Workers took stopwork action under the demand “the right to strike”. The demand was also popular with construction and other workers. The right to strike campaign collected 350 signatures on a petition to scrap the anti-strike provisions from the Fair Work Act in favour of the unrestricted right to strike. The petition also called for the ACTU to organise national stopwork rallies. Speakers at the rally highlighted the GWC Cranes and Boom cranes strikes, which have been suspended on the basis they are “pattern bargaining” – the union is using a template agreement across multiple sites. So it should! This again highlights just how far the anti-strike laws have gone. We need a clear union-wide campaign against the laws, and to openly defy them. Between now and the next rally in October delegates across the union movement should pass motions calling on their union to bring people out on stopwork action, or at the least to mobilise large contingents. We need to bring down this government and show Labor we are ready to keep up the fight.